Since the beginning of his obsession with music at 8 years old, David Isaacs has focused his attention on the guitar. An Eroica Classical Recording Artist, David has been playing guitar since 1988 and has performed throughout the US and Greece as a soloist, a chamber musician, and with guitar orchestras. David has released 4 CDs and has been featured on radio stations across the US. The American Record Guide’s Ken Keaton wrote “Isaacs plays with sensitivity and technical finish and is more emotionally committed to the music and its images than many far more famous players.” As a pedagogue, David is Adjunct Faculty, Instructor of Guitar at Cerritos College and Cypress College where he conducts guitar ensembles, coaches chamber groups, and guides young players on their path to University study, judges for guitar competitions, and teaches at Morey’s Music, Masterclasses, and at his home studio. In print, David writes sheet music reviews for Soundboard and authored The Essential Classical Guitar Scale Book with Michael Anthony Nigro. David helped establish and operate the Long Beach Classical Guitar Society, the Long Beach Classical Guitar Academy, and the Southern California Classical Guitar Summer Workshop for over 7 years. David earned his Master’s and Bachelor’s degrees in Classical Guitar Performance at California State University, Fullerton under the tutelage of David Grimes. An avid rock music fan, David shares this passion in History of Rock courses at Cypress College as well. Chanson du Soir is comprised of soprano Chelsea Camille and classical guitarist David Isaacs. 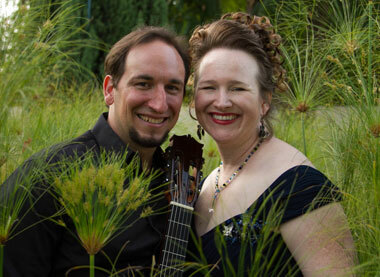 Established in 2005, the Southern California natives have garnered national recognition as a premier guitar and voice duo and have been featured artists on concert series throughout the United States. Driven by a passion to share their art, Chanson du Soir has booked, promoted, and completed over thirty tours of various regions of the US. Chelsea is the photographer, contacts the presenters, and makes the travel arrangements while David takes care of the graphic design, web pages, and CD artwork layout. They split the driving. In addition to performing, Chanson du Soir teaches Masterclasses, adjudicates competitions, supports new compositions and transcribes works for their unique pairing. The first composition dedicated to Chanson du Soir, “Music, When Soft Voices Die” by Brian Christopher Madigan is published on Clear Note Publications. Chanson du Soir’s debut CD, Melancholie et Espoir, was released on Abet Music and has received airplay on KIRN in Los Angeles, on Dayton Public Radio’s “The Intimate Guitar,” and Chanson du Soir were featured for an in-studio live performance on Houston’s Public Radio KUHF, “The Front Row.” In the Fall of 2013, Chanson du Soir will release their sophomore effort The Thirst that from the Soul doth Rise: Songs of a European Renaissance and will be touring extensively to bring their latest arrangements to audiences worldwide.